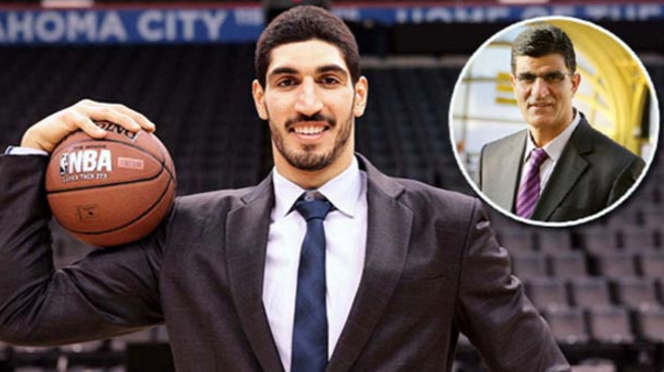 A Turkish prosecutor has charged NBA star Enes Kanter’s father with “membership in a terror group,” seeking 15 years in jail for him. An indictment prepared by the public prosecutor’s office in Turkey’s Tekirdag province has been accepted by a penal court in the same city, pro-government Yeni Safak newspaper reported Monday. Kanter’s father, an academic who was earlier removed his job at the Istanbul-based Medeniyet University over his alleged ties to the Gulen movement, has been charged with membership to the same group. Turkish government blames Gulenists for the 2016 failed coup and consider them terrorist while the group denies involvement and any terror activities. The prosecutor’s office claimed that NBA player’s father was in contact with 127 suspected supporters of the movement in the past, and he faces up to 15 years on charges of membership to a terror group. Media reported that an arrest warrant was issued for the father who had earlier spent several days before being released on judicial control as part of the same investigation. The same media outlet said the prosecutor’s office seeks up to 10 years of jail sentence, not 15. “I will continue to keep fighting for Human Rights and Freedom of Speech. Justice and Democracy above all.I will stand for what I believe in.All I’m doing is trying to be voice of innocent people. Keep my family, innocent people in your prayers,” Enes tweeted Monday. This is not the first time Kanter family got in trouble with authorities in his hometown. Enes Kanter, himself, faces several years in prison for allegedly insulting Turkey’s state officials, the President Recep Tayyip Erdogan in particular. Meanwhile, he also fell victim to the Turkish government’s worldwide net against Gulen followers after he pledged support to the movement. Last year, his passport was briefly seized by Romanian police upon a request from the Turkish government. Once he landed in the US, Kanter revealed that Turkish government had tried to catch him also in Indonesia. Currently, Kanter has an outstanding arrest warrant and his Twitter account is banned in Turkey.